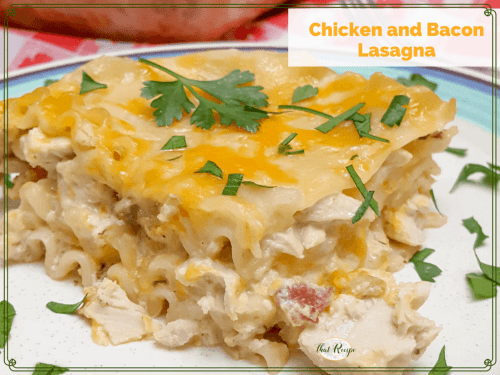 If you are looking for some warm and homey comfort food, this Cheesy Chicken and Bacon Lasagna is a delicious tomato-free alternative. When I make my usual lasagna recipe, my son scrapes off the meat and sauce and basically just eats the noodles with Parmesan cheese sprinkled on top. He doesn’t like ground meat or tomato sauce. Luckily his Uncle Dan came to the rescue with this tomato-less chicken lasagna recipe. Knowing his big cousins like it was the selling feature. It is based off of the Hidden Valley Ranch recipe, but I kicked it up a bit with some BACON!!!!! because, well… BACON! 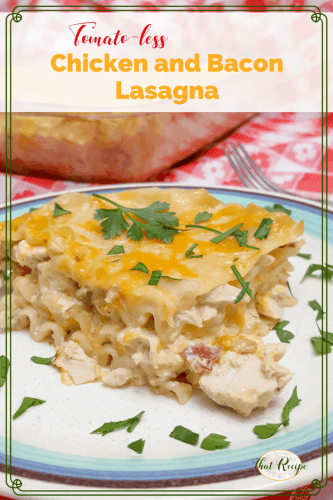 I actually want to further tweak this recipe because you need to purchase an entire pound of lasagna, but only use about 9-12 noodles. If you use more than that you do not have enough filling and cheese. I am listing the recipe as I made, and may revise it at a later date. While noodles are cooking, combine milk, ranch dressing and black pepper in a medium saucepan. Bring to a boil. Add chicken and cooked bacon, reduce heat to low and simmer for 20 minutes. Bake at 350 degrees for about 40 minutes until cheese is bubbling. Let sit 10 minutes before serving. Previous Post: « Easy Last Minute Gift Idea: Homemade Chocolate Bark. Come on by on Tuesday, Linda. I always love to see your posts.